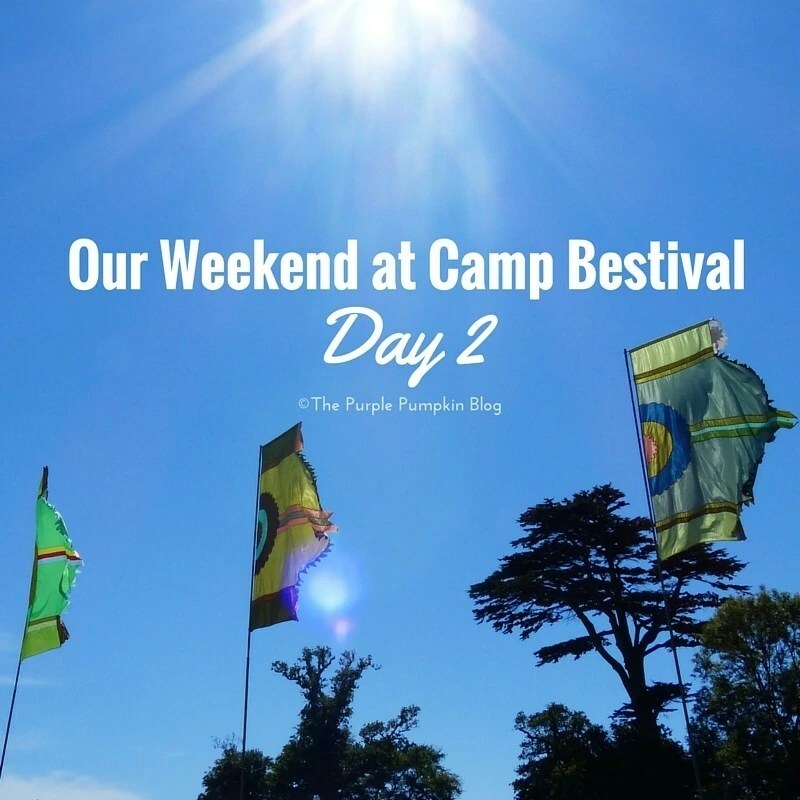 Following on from Our Weekend at Camp Bestival: Day 1 – Setting Up Camp, here is our take on day 2. 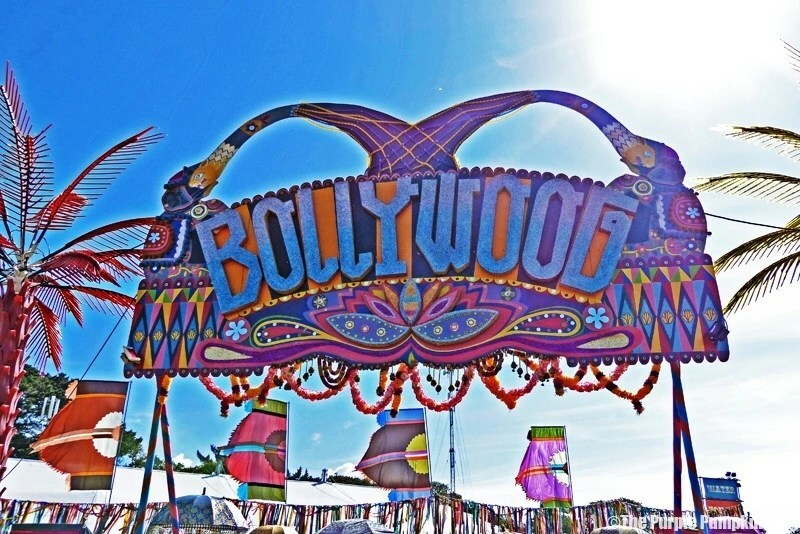 What I felt was so great about this festival was that there is so much to do, that everyone has a different experience. 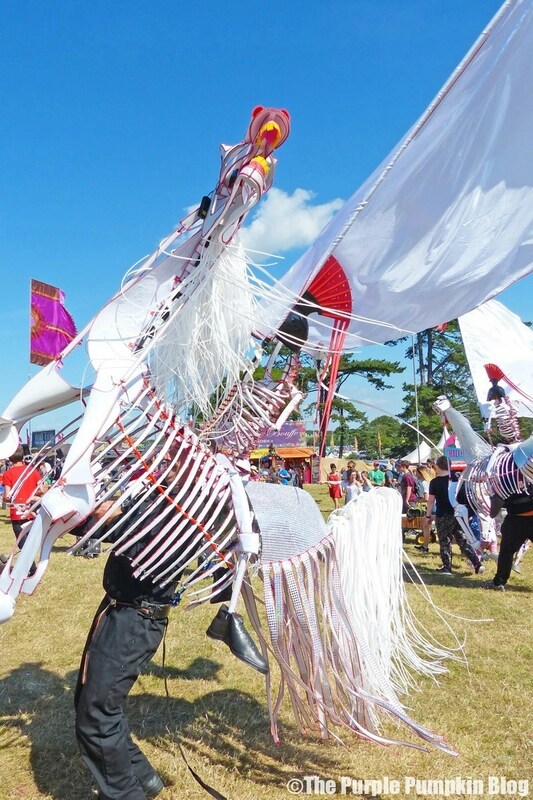 Could we have done more with our first day at the festival (day one was all about setting up camp)? Possibly. But I know that I couldn’t manage as much as I wanted to, but there is always next year! 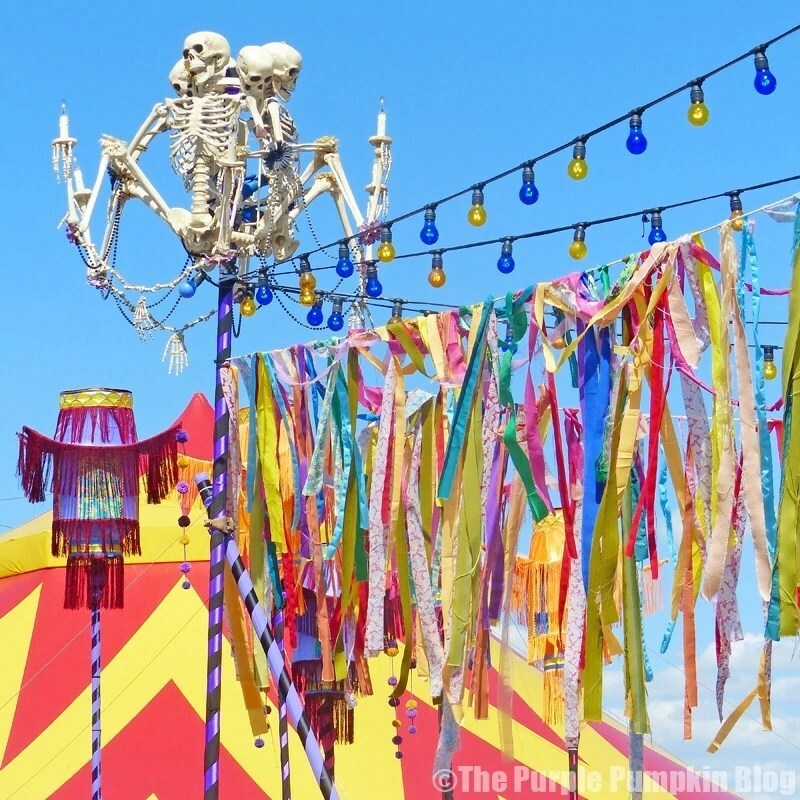 I took a lot of photographs during our weekend at Camp Bestival, so this post will be photo heavy – although, that’s not really new information if you read my blog regularly! You can click on the images in the galleries to view them larger. After a surprisingly great nights sleep in our tent, we woke up early to get ready, have some breakfast and head down to the festival entrance. I’d seen blogger friends on social media saying how freezing it had been during the night, but in all honesty, we didn’t find it that bad. In fact, the extra blankets we had brought with us, never got used at all. Our tent was a lot more insulated than we thought it was going to be! Getting up early also meant that we missed the longer lines at the loos and showers. We didn’t bother to shower all weekend though, we’d bought something called Muc-Off, a dry shower gel, and that served us well. I’m the sort of girl who needs to have a shower every day, or else I feel scummy, but this stuff was fab. I’d also brought some dry shampoo to spray in my barnet, and all was right with the world! Steve got some brekkie on in the form of bacon sarnies, setting light to the pan in the process, and a cup of coffee. 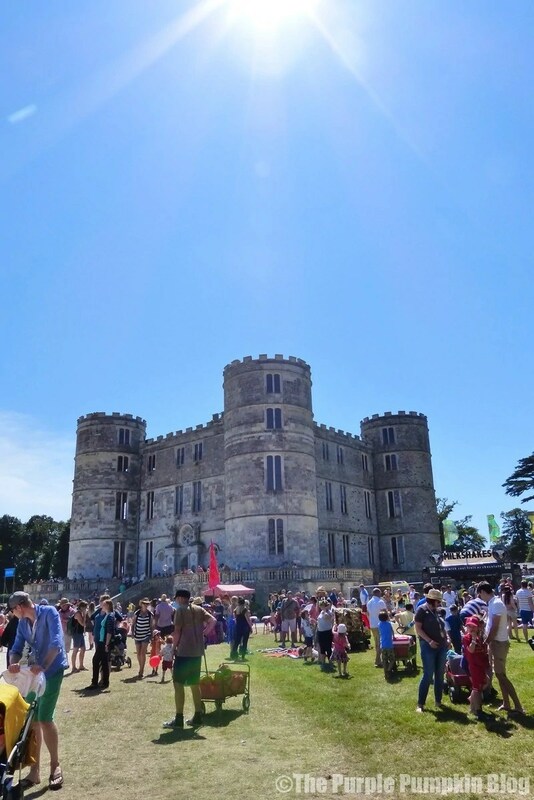 The sun was shining, and it was shaping up to be a great day weather-wise, which was a welcome relief after a fair bit of rain the weekend before and leading up to Camp Bestival weekend. We packed all of our stuff away zipped up our tent – taking valuables with us (phones, cameras, keys, wallets). I can’t say I felt worried about leaving stuff in our tent, everyone else is doing the same. I did hear, after the event, of some items being stolen from tents, to me that’s a low-life thing to do. But simply put, don’t take anything with you, that you can’t afford to lose. I therefore didn’t wear my rings, as I can’t sleep with them on, and didn’t want to lose them, so they stayed at home. Similarly, we left iPads and tablets at home too. 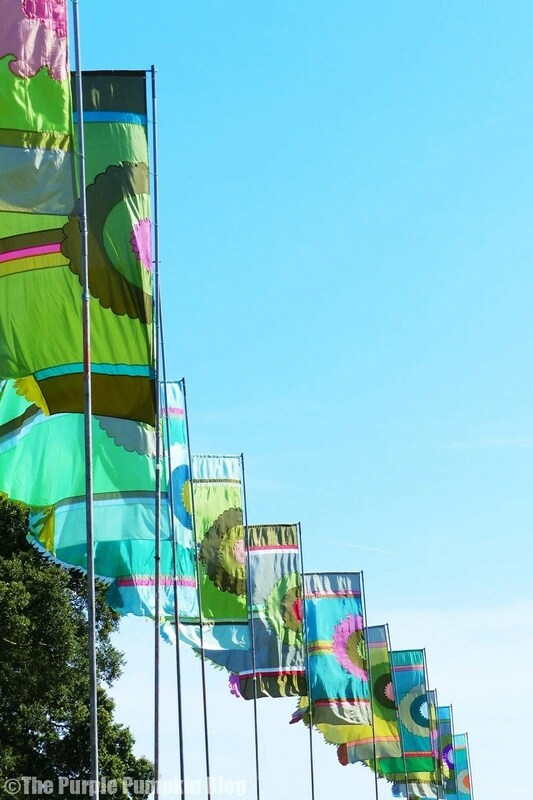 With everyone ready, we walked the 10 minutes or so from our tent down to the Camp Bestival entrance. We decided to bring our trolley with us to pull about our chairs, blanket and back pack. I know a lot of parents take a trolley around to carry their stuff – and their kids, when they are tired and sleepy, so didn’t think it was a big deal to make things a bit easier for us. I wasn’t able to carry stuff around, it wasn’t fair for Steve and Liam to be pack horses for the day. I have read comments online about the amount of trolleys, but, I think as long as you’re sensible with them and don’t block people’s way, they are fine. If you’re out from early doors till midnight, it’s a long day to be carrying things around with you. 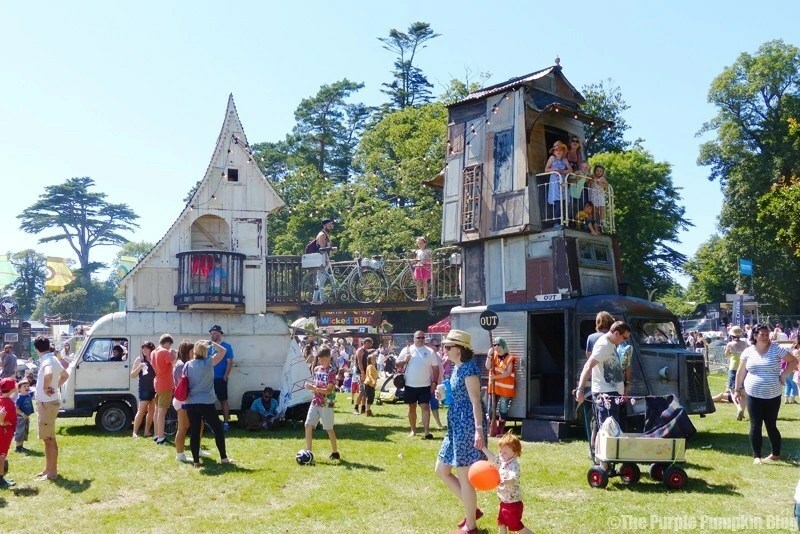 Our walk through the camp also meant we got to see lots of different types of tents, flags and trolleys – it was great to see the way people had customised their living area for the weekend, some were genius! I think you could tell the seasoned campers from the not so seasoned! We decided to just go with the flow as far as the day was concerned. There were not any bands we really wanted to see, and we wanted to get a lay of the land, and see what was where. I think the place could do with a few sign posts here and there so you know what direction things are in. You can buy a programme which has a map in it, and there is also a lanyard that comes with it, but if you get split up, you’re a bit stuck! It would be nice to if lanyards were provided for all, in the cost of the ticket perhaps? 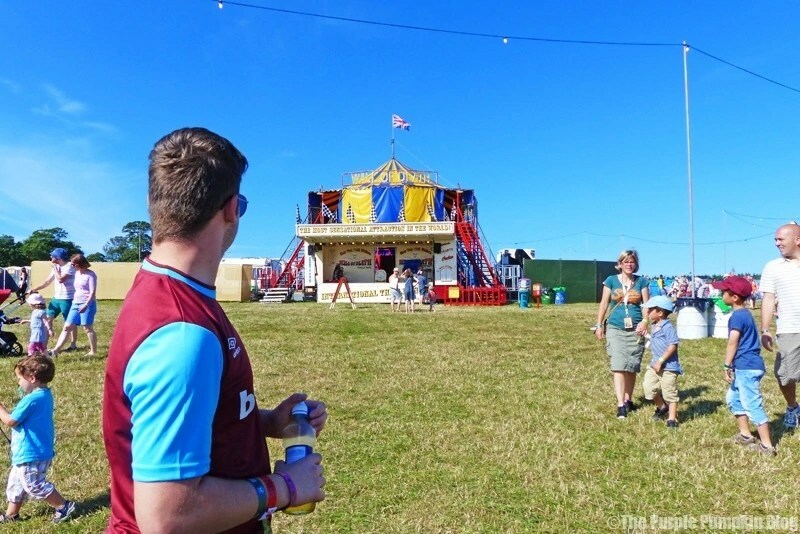 As we walked in, the first thing we saw was a big top in front of us, with the Wall of Death to the side, some toilets and the festival hospital to the right. And lots and lots of flags! We made a mental note to come and watch the motorcyclists in the Wall of Death, but I’ll tell you from the future, that we didn’t actually do it in the end. 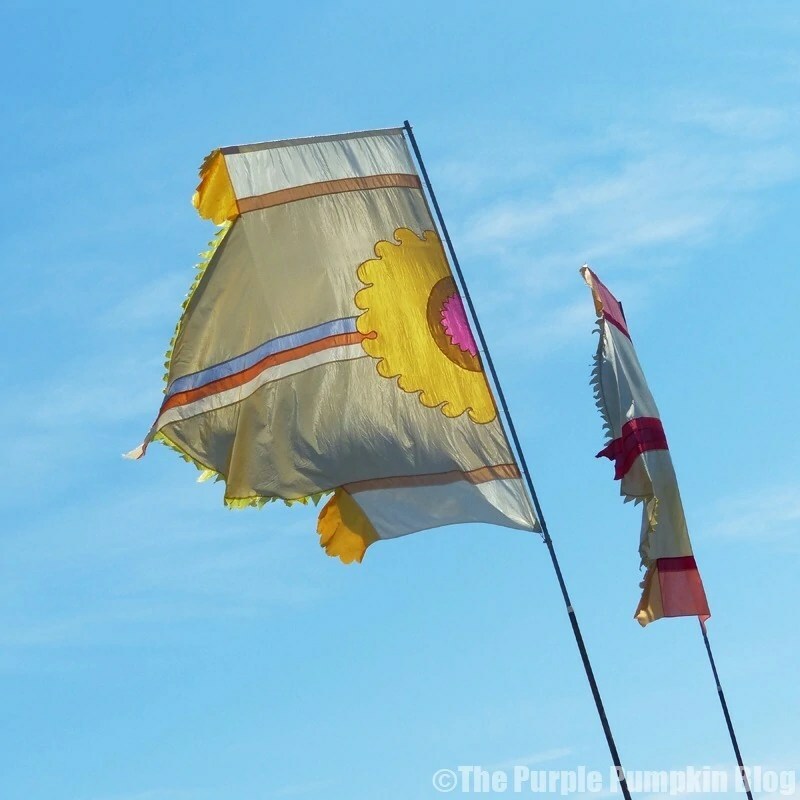 I think it’s been at the festival before, so likely to be there again… next year perhaps? 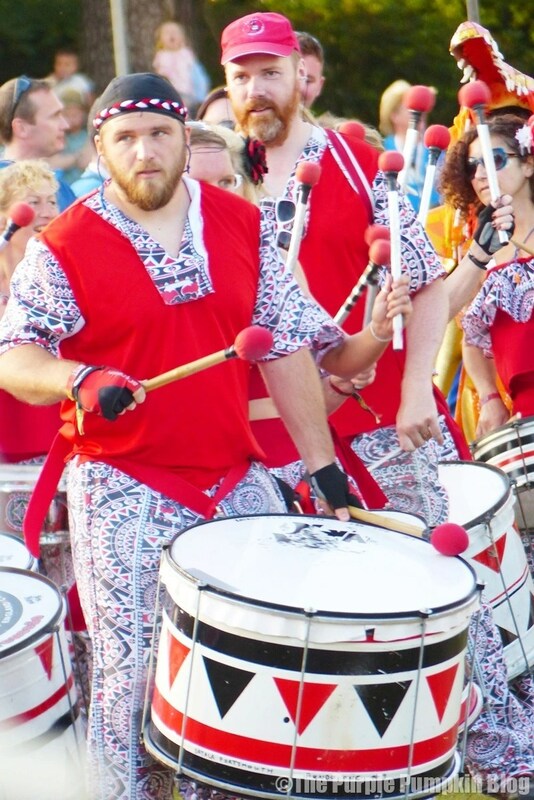 As we walked down towards the action, we heard the sound of drums and was greeted to our first performance from Batala Portsmouth, an authentic Brasilian Samba-Reggae troupe. I love the sounds of drums, and they were excellent to watch. The were leading the way for the Shademakers, a wild parade of weird, wild and wonderful creatures. 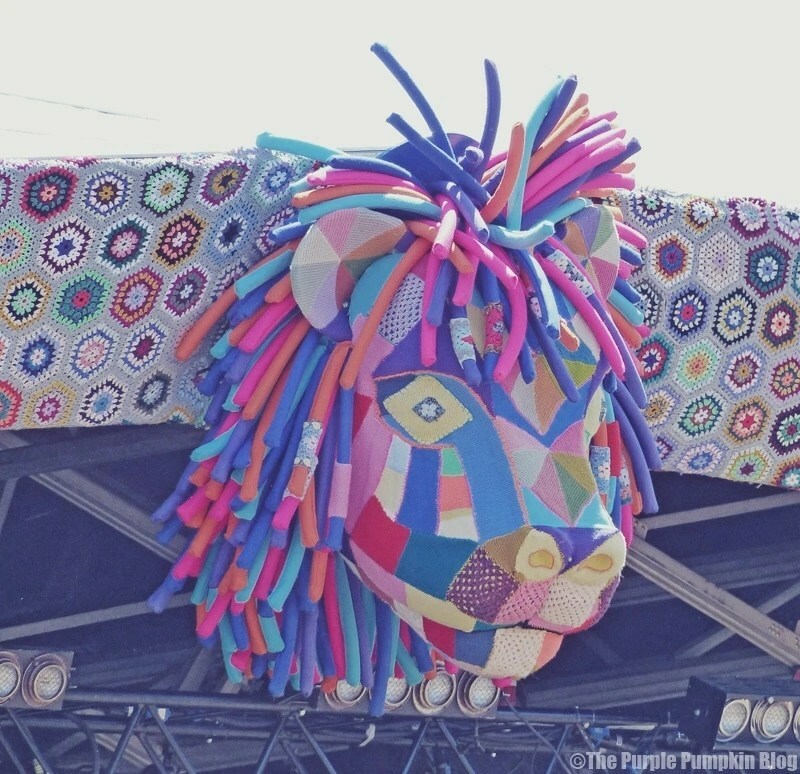 They were something I wanted to catch at Camp Bestival, so I’m glad we did! The creatures were indeed weird and wonderful, with a squirrel (I think!) running up behind me for a photo! 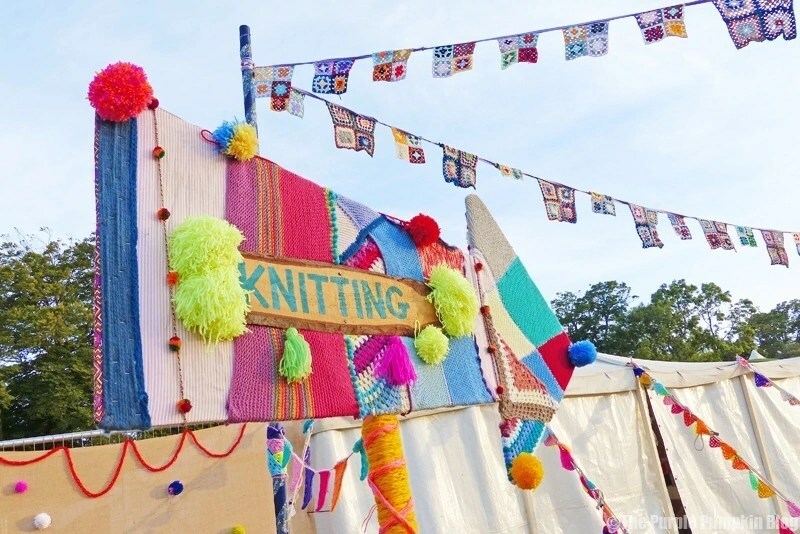 We saw the knitting tent which I had planned to go into (but didn’t) and the festival shop, which stocked some basic supplies like milk and eggs, but we didn’t need to go here, so have no clue how much things cost. 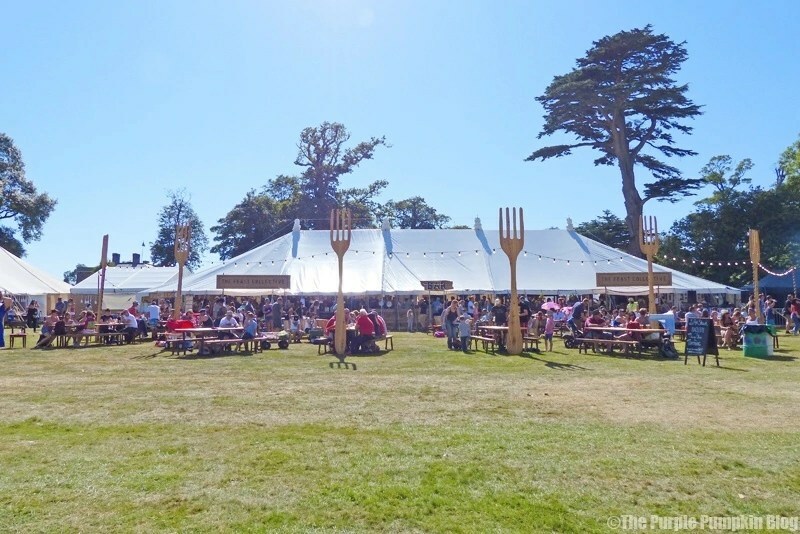 I’ve already written a post about the Food at Camp Bestival, as well as about The Feast Collective, so won’t go over it too much here, but Liam decided he was hungry, and so bought a piece of cheesy garlic bread, from The Garlic Farm Field Kitchen. 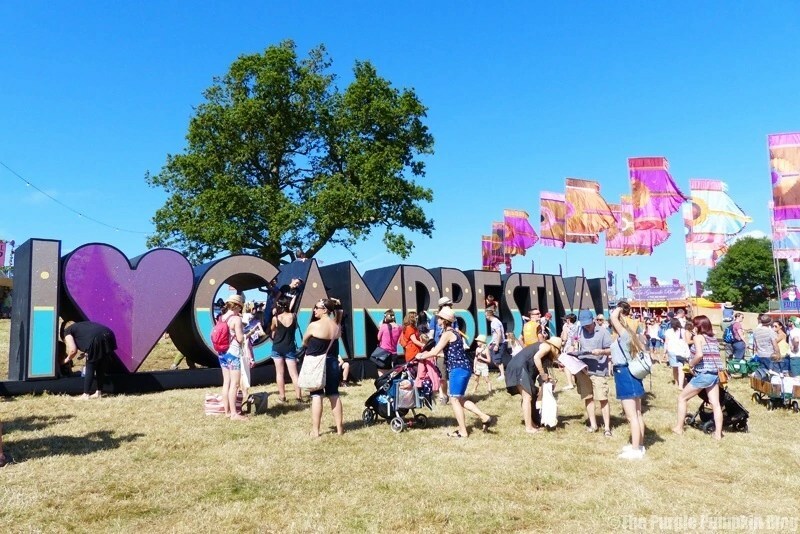 We saw the huge I ♥ Camp Bestival sign which children were climbing all over, as well as Oberon’s Observatory. We walked on down to Bollywood which was next door to the Day of the Dead Cocktail Bus, which would be the location of the blogger meet up the next day. 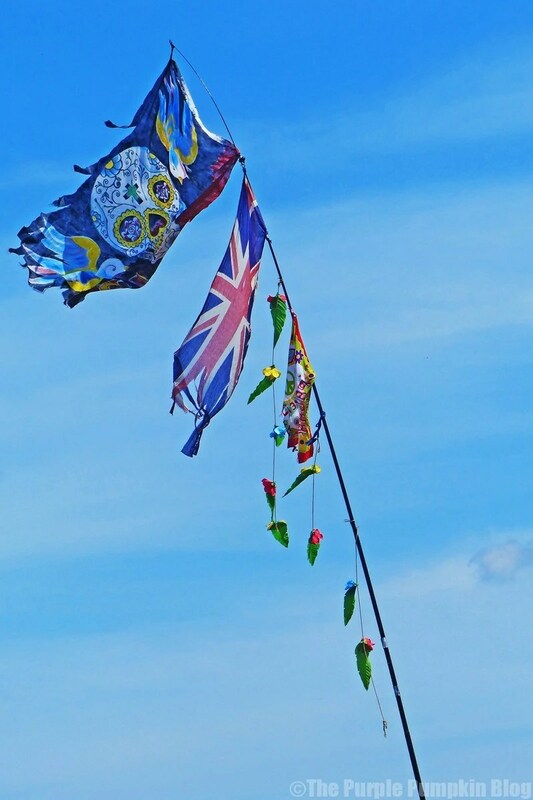 It was easy enough to find, thanks to all the gorgeous flags, rags and decoration. 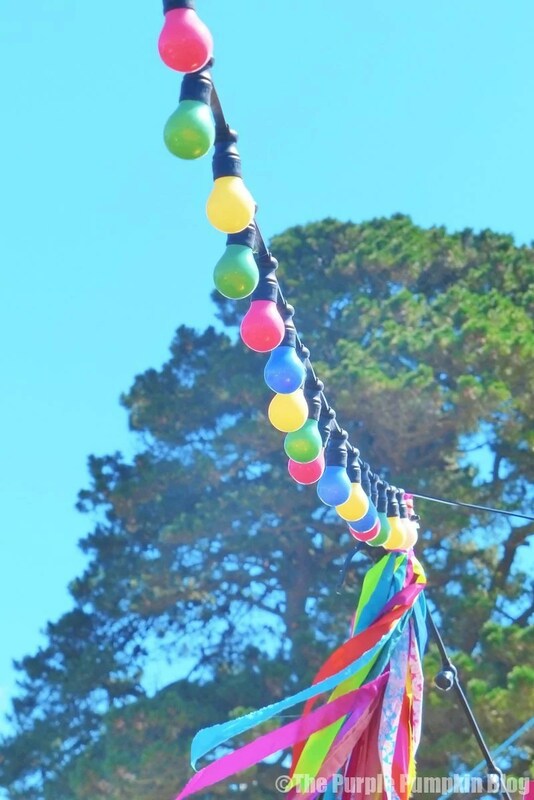 I really loved this area of Camp Bestival, it was so bright and colourful. We made our way down to the front (ish) and found a spot to set up our chairs, and grab some lunch from one of the kiosks that lined the edges of the field. Steve had a roll from the Whole Hog – which was packed full of succulent pork. The portion was very good, and they didn’t skimp on the meat. They had one of their whole hogs being roasted, in full view, which was pretty impressive! I had a halloumi wrap from Poco Morocco, which was very flavourful, and had a spicy kick. I think it could have done with a bit more halloumi. Finally, Liam had a burger and chips from Meatshed Burger Shed. He pretty much always plays it safe with burgers wherever we go! 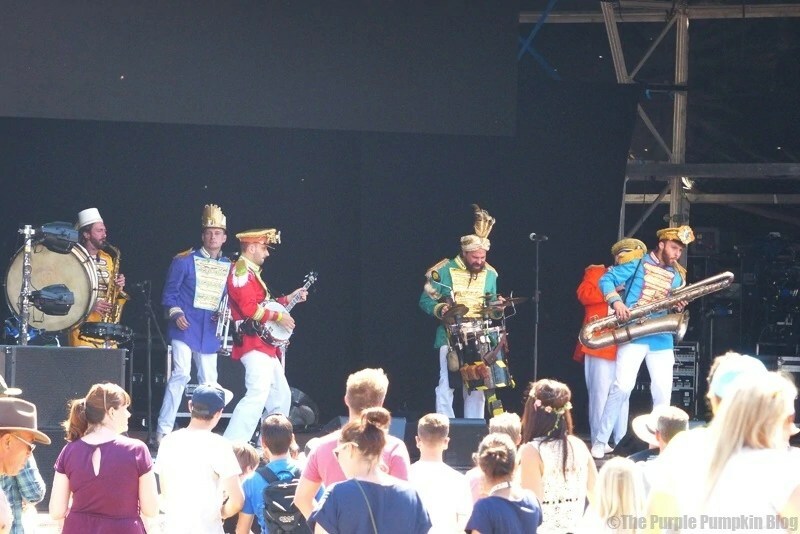 We caught a couple of acts on the stage, including Mr. Wilson’s Second Liners, described as Quintessential New Orleans meets 90s club classics, and I thought they were brilliant! I think the mixture of a brass band and club classics that I remember from my clubbing days is what made me love them! Next up were an act called The Spooky Men’s Chorale, which were strange to say the least, but by the time they sang their final song I was actually in hysterics at what they were singing about – Barry Gibb of the BeeGees! 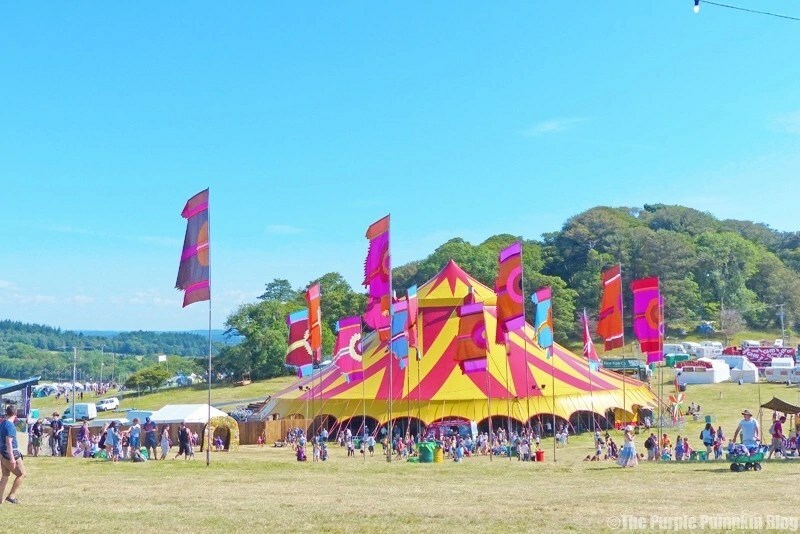 We made our way to the upper field to locate The Feast Collective, and because we found out you could buy the giant bubble wands from somewhere up here too. We also wanted to watch Gill Meller’s demonstration in the Festival Kitchen. 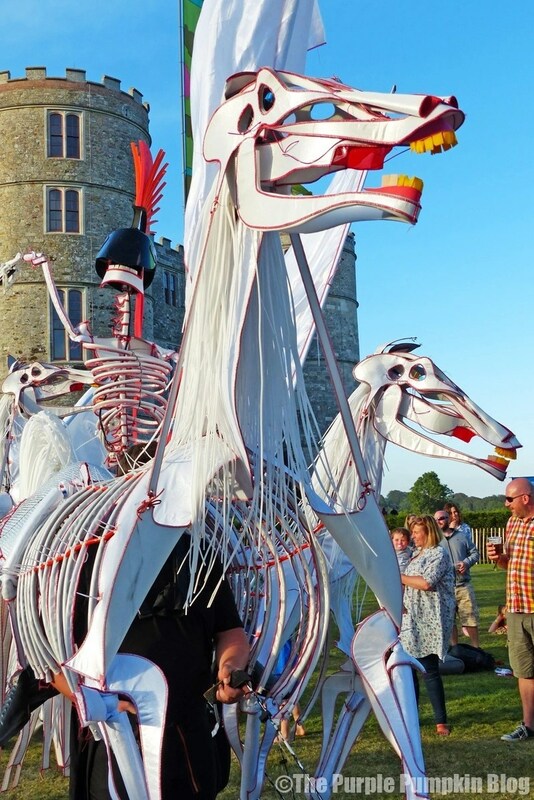 We grabbed a cocktail from Josie Da Banks Jam Jar Bar, and saw another parade walk through, this time led by the Rajasthan Heritage Brass Band; with stilt walkers and Bollywood dancers. We grabbed some dinner from The Feast Collective; I had a Bulgogi Beef Salad Box from Korrito – £7.50, Steve had Lamb Tagine Wrap from The Thoroughly Wild Meat Co. – £9; and Liam had a Cheeseburger from DJ BBQ. Once again, we saw Batala Portsmouth and the Shademakers parade on by, and then another troupe came along – Igor Rasputin’s Caravan of Lost Souls: Exiled from his native Prussia, Igor Rasputin and his incredible ape-powered pop-up Circus is forever feted to travel the four corners of the Globe, gathering the Greatest Wonders of the World for his extraordinary menagerie! 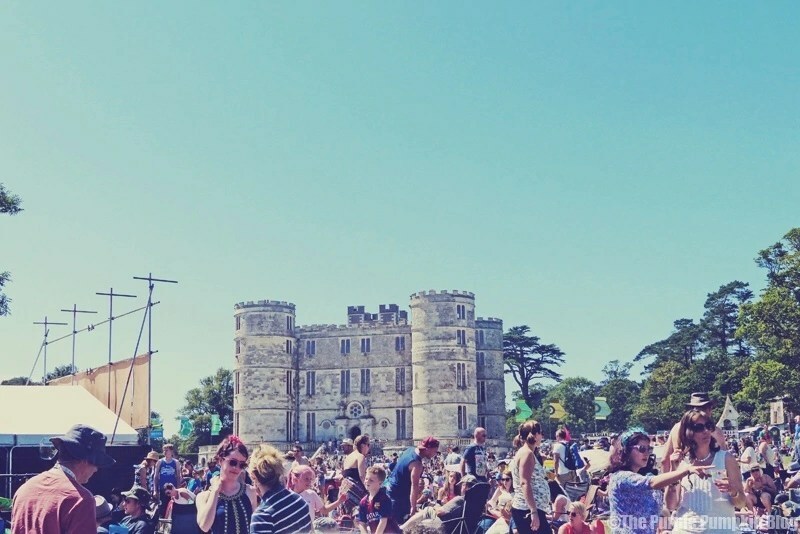 We didn’t fancy any of the evening acts on the Castle Stage, so decided to start heading back to camp. The sun was beginning to set, and it was magnificent! It looks like it was fab there! 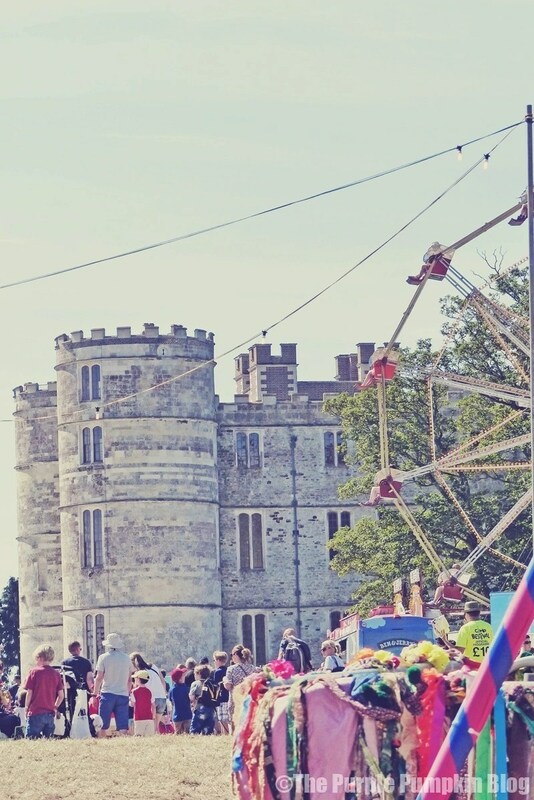 I always want to go – maybe next year! It certainly was fab! So much to see and do! 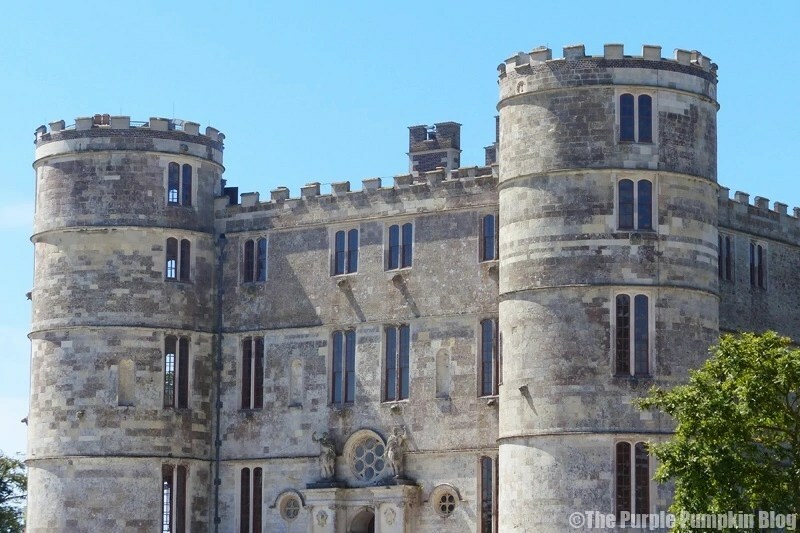 We were at Lulworth Castle a few days before while it was being set up. I’d love to go, but I’m not sure how I’d like the no proper showers/toilets at festivals. I need decemt shower blocks for camping. ooh it looks totally amazing, there is so much to see and do. 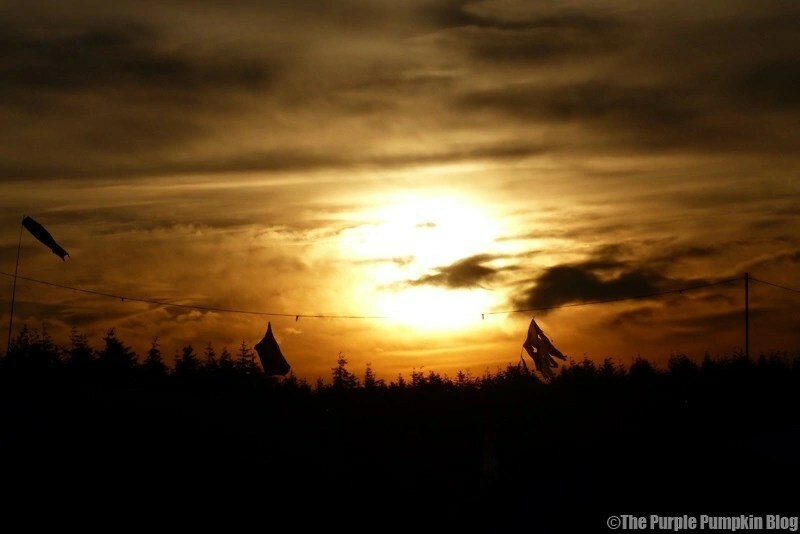 I haven’t been camping for many years but I’d probably consider it for a festival like this, I may attempt it next year. There was tons to see and do – I know we certainly didn’t see everything! I hope you get the chance to go! Oh wow! 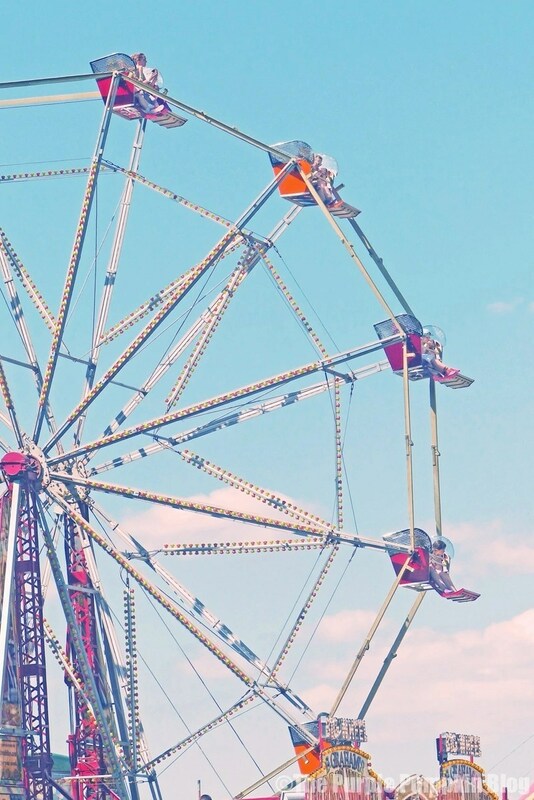 It sounds and looks like you had an amazing time! 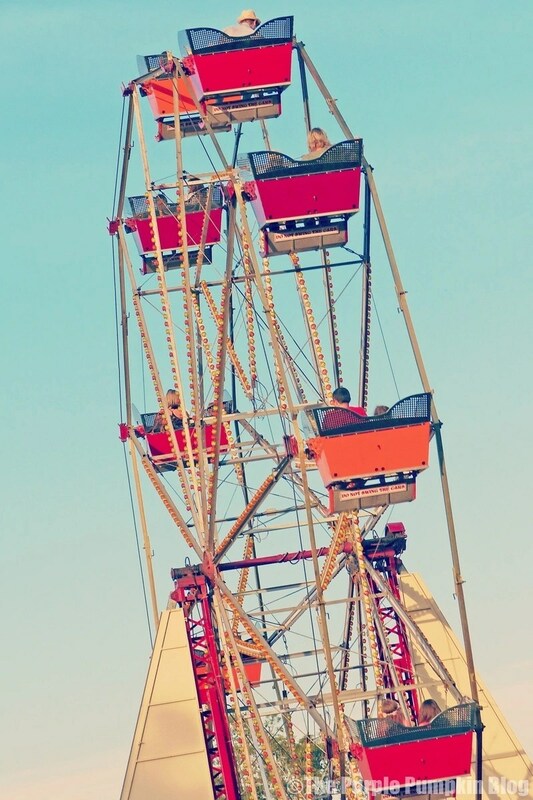 The only downside for festivals for me is the camping.